Cagatay Demiralp, Cullen Jackson, David Karelitz, Song Zhang, and David H. Laidlaw. CAVE and Fishtank Virtual-Reality Displays: A Qualitative and Quantitative Comparison. IEEE Transactions on Visualization and Computer Graphics, 12(3):323-330, May 2006. (pdf) (bibtex: Demiralp-2006-CFV). Daniel Keefe, David Karelitz, Eileen Vote, and David H. Laidlaw. 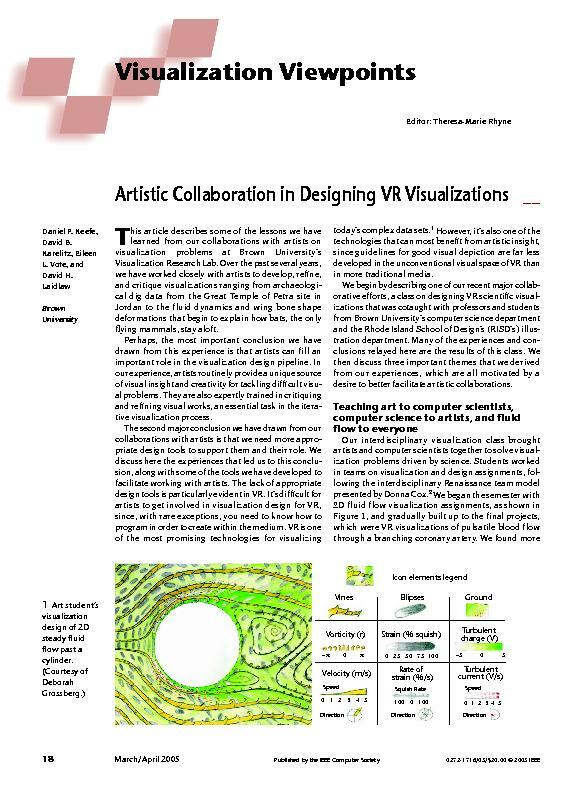 Artistic Collaboration in Designing VR Visualizations. IEEE Computer Graphics and Applications, 25(2):18-23, March/April 2005. (pdf) (bibtex: Keefe-2005-ACD).